A few weekends back I was fortunate enough to attend part of the AASL National Conference in Hartford, CT. Rising to the Challenge was the theme of the 16th biennial event. Since I am a media specialist at two elementary schools, I could easily relate to the theme, and was very excited to attend my very first national conference. I missed the first two days of the conference, but arrived in time on Friday to attend the Tweet & Greet event with authors and the UnConference from 9 pm – midnight. 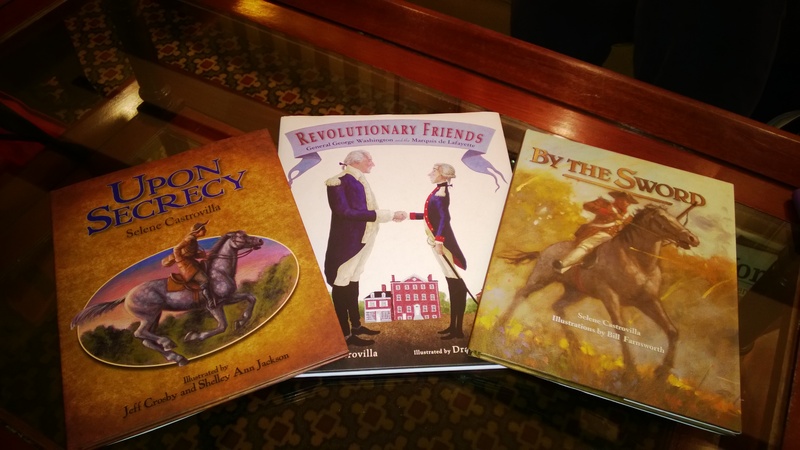 I met two great children’s authors – Selene Castrovilla who wrote the amazing historic picture books Revolutionary Friends – General George Washington and Marquis de Lafayette and By the Sword and Ruth Sanderson who has retold and beautifully illustrated many folk and fairy tales . At the AASL UnConference, I met many terrific media specialists, and it was a great experience to share information in such a relaxed and fun way. I recorded the A-Z of the UnCon 2013– announced by Lyn Hay and Ross Todd that gives a brief overview of the highlights of the event. Saturday was chock full of workshops and visits to the exhibition hall. For those who have been before, there are many concurrent workshops, and it’s not possible to attend them all (thankfully, many were recorded). I started at 7am and took in as many events as I possibly could in the time I had available. Notable workshops I attended were Blog the Book and CyberSmart, CyberSafe. I was also fortunate to meet authors in the exhibition area – Laurence Pringle, Andrea Davis Pinkney, and Matthew Holm. Peter Bregman’s closing session spoke directly to me – I am a limited resource, and need to be sure to give myself time to reassess the progress of my day and not let myself get stretched too far in too many directions. Dinner was at the Marquee, a lovely venue for a large group like ours, and was delighted to sit with David Loertscher, Professor at San Jose State University, School of Library and Information Science, Kathryn Lewis, Director of Media Services , Norman Public Schools and Marc Crompton, Head of Senior Library at St. George’s School, Vancouver, BC. David and Kathryn were the authors of Implementing the Common Core State Standards: The Role of The School Librarian Action Brief. Sunday morning was another highlight of the weekend, when I attended the Author Breakfast with graphic novelists Faith Erin Hicks, Jennifer and Matthew Holm, Jarrett Krosoczka, and Raina Telgemeier. Each gave an interesting and informative presentation, and it was so much fun watching their drawing competition at the end. I created a video of the highlights …hope you’ll take a look!